complete set of learning tools and techniques that will help you ensure that your company does not fall afoul of their legal and regulatory obligations and leave themselves open to misuse from money launderers. Their MLROs have worked with some of the biggest financial institutions, at a national and global level, and are up to date with the latest developments and practices in the field of anti-money laundering, anti-bribery & corruption and counter-terrorism financing. The areas in which we offer our expertise, covers the entire range of corporate responsibility in AML. AML Assessment will bring your senior management and staff up to speed with all the AML Legislation in the UK as well as relevant AML Regulations from international bodies. Through their programme, your staff will be fully attuned to identifying AML Risk and acting in accordance with the proper procedure. Whatever be the workings of your firm, once you take us on as your assessment specialists, we take full responsibility in ensuring that you receive the best and most comprehensive AML training and implementation of systems and controls there is to offer. 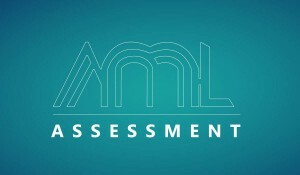 AML Assessment will help you appoint a Nominated / MLRO officer who will be trained and be ultimately responsible for implementing the checks and processes needed at regular intervals to ensure complete compliance. AML Toolbox: Go to iTunes or Google Play and download the APP today – look for AML Toolbox.